IS LOVE A LOSING GAME? Who would have thought that in the Summer 2011 we would lose what was one of Britain’s youngest and most renowed musicians in the world. Standing at 5″3′, Amy Winehouse had one of the most distinguishable voices in the world, one of the most eye-grabbing images, and one of the most addictive personalities. Her flux from lost girl to queen of music was followed closely by the paparazzi, and her image never fully left the media. September 14th marked what would have been this modern-age Audrey Hepburn’s 28th birthday… And London’s street artist, Bambi, wasn’t far behind to keep her image alive. Situated behind Camden Town Underground Station (16 Camden Road), this gorgeous piece, for the first time in Bambi’s history, was carried out in colour. 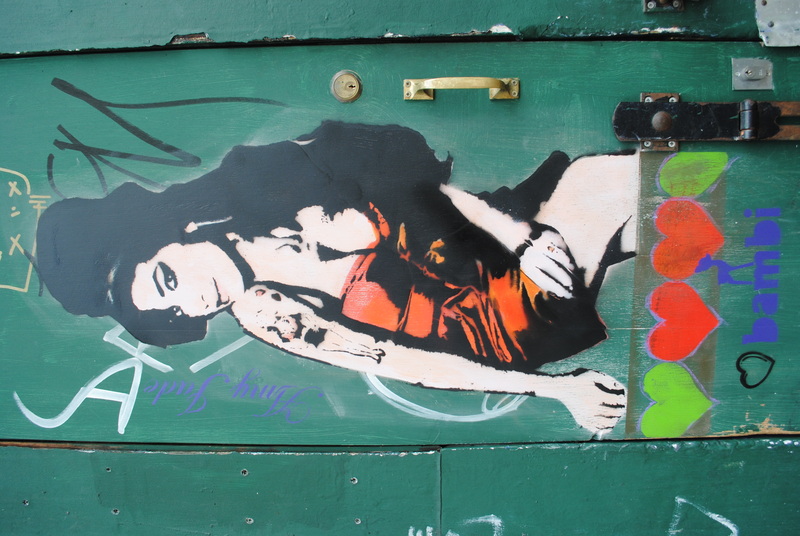 A bright green door is the backdrop, and Amy’s black hair, vivid red dress and glinting smile, tells a story of the girl behind the speakers; one who will always be with us through the medium of song… This must be why she is in colour rather than the dullness of black and white – she will always be present. Following Bambi’s recent art history, anyone looking closely will see a distinct pattern..
Bambi Amy- original stencil & spray paint on paper, edition of 25 hand signed and numbered in pencil. The pattern is innate, and reveals the artist’s meaningful work. It is always a message of love. Her recent ‘Amy, piece follows on this path, with hearts laced across the bottom of the piece. It is evident to see this artist does not only represent the here and now, or puts up works of sheer genius for others to see; she connects with these individuals. She’s an earth angel. WALTON FINE ARTS IS BAMBI street ARTIST original gallery.